Candico has a "world class manufacturing facility" (ERC, London) in its 'state of the art' plant at Nagpur, Maharashtra. The largest of it's kind in the country, the plant is spread over a sprawling 15-acre campus, complete with lush lawns and a stream that flows right through it. It has a constructed area of over 350,000 square feet, of which close to 300,000 is fully particle, humidity and temperature controlled. The plant has a production capacity of 45,000 tonnes, which makes it one of the largest manufacturing facilities of its kind in India. 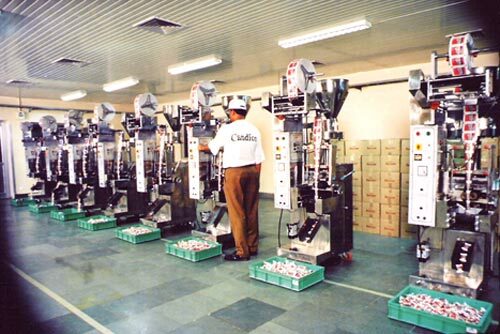 The Candico manufacturing facility at Nagpur, due to the substantial amount of capital investment and the superior technology used in the manufacturing process, is the only plant in the country that is capable of manufacturing the entire range of confectionery product in each one of the existing categories. The equipment has been sourced from multiple vendors in Europe including Togum, France; AMP Rose, UK and BWI Manesty, UK. The use of these highly efficient machines allows the highest possible standards of quality even when producing large quantities. The capital investment in the facility and machinery and relentless quality consciousness ensures that Candico meets the most stringent food manufacturing standards prevalent anywhere in the world. Candico has entered into a technical collaboration with CURT GEORGI, a leading flavour company of Europe and EURO BASE, the fourth largest manufacturer of gum base in the world. The handshake with CURT GEORGI has been with the intention to develop the nascent flavour engineering in the country into an accurate science. The relationship with Euro base has enabled Candico to gain access to the latest technological developments in the area of gum base. These collaborations have helped Candico add the qualitative edge to its products, thereby making them at par with international brands.